In 1990, the army had nearly completed a major overhaul of its basic force structure. It eliminated its old divisional infantry organization and established the brigade as the largest operational unit. The army converted ten of twelve infantry divisions into twenty-nine tank, mechanized and mountain infantry brigades with integral artillery, air defense and anti-tank regiments. One airborne brigade was organized before 1990. The shift to brigade-level organization provided greater operational flexibility, maneuverability, tactical initiative and reduced the possibility that large army units would be destroyed in set piece engagements with an aggressor. The change created many senior field command positions that would develop relatively young and talented officers. The brigade structure had advantages at a time of declining manpower. The arms industry was dominant in the Yugoslav economy. With annual exports of $3 billion, it was twice as large as the second largest industry, tourism. Several companies in Yugoslavia produced airplanes and specifically combat aircraft, most notably SOKO of Mostar, with the Soko J-22 Orao being its best known product and there was Zastava Arms for firearms and artillery. Another important manufacturer was Utva in Serbia. The Yugoslav military-industrial complex produced tanks (most notably, the M-84), armored vehicles (BOV APC, BVP M-80), various artillery pieces (mortars, multiple rocket launchers, howitzers), anti-aircraft weapons, as well as various types of infantry weapons and other equipment. JNA had modern infrastructure with many air bases including underground shelters and command and control centers in many locations including several mountains. The biggest and best known installation was the Željava Air Base, also known as the Bihać Underground Integrated Radar Control and Surveillance Centre and Air Base, in Bosnia and Herzegovina. The ground forces led in number of personnel. In 1991 there were about 140,000 active-duty soldiers (including 90,000 conscripts), and over a million trained reservists could be mobilized in wartime. Each of the Yugoslav constituent republics had its own territorial defence forces which in wartime were subordinate to supreme command as an integral part of the defence system. The territorial defence (reserve force) was made up of former conscripts; they were occasionally called up for war exercises. The ground forces were organised into infantry, armour, artillery, and air defence, as well as signal, engineering and chemical defence corps. The Yugoslav Air Force had about 32,000 personnel including 4,000 conscripts, and operated over 400 aircraft and 200 helicopters. It was responsible for transport, reconnaissance, and rotary-wing aircraft as well as the national air defence system. The primary air force missions were to contest enemy efforts to establish air supremacy over Yugoslavia and to support the defensive operations of the ground forces and navy. Most aircraft were produced in Yugoslavia. Missiles were produced domestically and supplied by the Soviet Union. The Yugoslav Air Force had twelve squadrons of domestically produced ground attack fighters. The ground attack squadrons provided close air support to ground force operations. They were equipped with 165 new Soko J-22 Orao, Super Galeb and J-21 Jastreb, and older Soko J-20 Kraguj fighters. Many ground attack fighters were armed with AGM-65 Maverick air-to-surface missiles purchased from the United States. Others were armed with Soviet Kh-23 and Kh-28 missiles. The air force also had about ninety armed Mi-8 helicopter gunships to provide added mobility and fire support for small ground units. A large number of reconnaissance aircraft were available to support ground forces operations. Four squadrons of seventy Galeb, Jastreb, and Orao-1 fighters were configured for reconnaissance missions. The Yugoslav Air Force had nine squadrons of 130 Soviet-made MiG-21 interceptors for air defence. First produced in the late 1950s, the MiG-21 design was largely obsolete in 1990 and represented a potential weakness in Yugoslavia's air defence. However, the bulk of the MiG-21 fleet consisted mainly of the bis variant, the latest production MiG-21 model, and was armed with Soviet Vympel K-13 (NATO reporting name: AA-2 "Atoll"), air-to-air missiles and some more modern Molniya R-60 (NATO reporting name: AA-8 "Aphid") missiles as well as twin 23 mm cannons. By 1989, Yugoslavia started developing a new domestic multirole fighter called Novi Avion, which was supposed to replace the MiG-21 and J-21 Jastreb fleets entirely. The design of the new aircraft was influenced by both Mirage 2000 and Dassault Rafale fighter types and it was to enter service by the early 2000s. As an interim solution, a modernization package was planned for the MiG-21 and it is speculated that India's MiG-21 Bison upgrade was actually intended for Yugoslav aircraft. In 1987, Yugoslavia acquired 16 MiG-29s. Although not officially known at the time, Yugoslavia was rumoured to have been interested in the purchase of certain numbers of Su-25 attack-aircraft and Mi-24 gunships. Instead of developing its own fighter plane, the Novi Avion, the country made a request to licence-build the F-20, but due to unstable relations with the US, the request was rejected. By the late 1980s, the licensed production of Aérospatiale SA 330 Puma helicopters was also envisaged, but due to the dissolution of the country, it was never realized. One of the most impressive structures operated by the JNA Air Force was the underground Željava Air Base near the town of Bihać in NW Bosnia-Herzegovina. The structure was made to withstand a nuclear explosion and was destroyed by the JNA in 1992 to prevent its capture. Željava was home to the 117th Fighter Aviation Regiment, which was composed of the 124th and 125th Fighter Squadrons, equipped with MiG-21Bis fighters, and the 352nd Reconnaissance Squadron, equipped with MiG-21R aircraft. The Air and Air Defence Forces were headquartered at Zemun and had fighter and bomber aircraft, helicopters, and air defence artillery units at air bases throughout the former Yugoslavia: Batajnica Air Base (Belgrade), Niš Constantine the Great Airport, Slatina Air Base (Priština), Golubovci Airbase (Titograd), Skopski Petrovec, Sarajevo, Mostar, Željava Air Base (Bihać), Pleso (Zagreb), Split Airport, Pula, Zemunik (Zadar), Cerklje ob Krki and many other smaller air bases. Minor surface combatants operated by the Yugoslav Navy included nearly eighty frigates, corvettes, submarines, minesweepers, and missile, torpedo, and patrol boats in the Adriatic Fleet. The entire coast of Yugoslavia was part of the naval region headquartered at Split, Croatia. The Partisans had operated many small boats in raids harassing Italian convoys in the Adriatic Sea during World War II. After the war, the navy operated numerous German and Italian submarines, destroyers, minesweepers, and tank-landing craft captured during the war or received as war reparations. The United States provided eight torpedo boats in the late 1940s, but most of those units were soon obsolete. The navy was upgraded in the 1960s when it acquired ten Osa-I class missile boats and four Shershen class torpedo boats from the Soviet Union. The Soviets granted a license to build eleven additional Shershen units in Yugoslav shipyards developed for this purpose. In 1980 and 1982, the Yugoslav navy took delivery of two Soviet Koni class frigates. In 1988 it completed two additional units under license. The Koni frigates were armed with four Soviet P-15 Termit surface-to-surface missile launchers, twin 9K33 Osa (NATO reporting name: SA-8 "Gecko") surface-to-air missiles, and anti-submarine rocket launchers. The Yugoslav navy developed its own submarine-building capability during the 1960s. In 1990, the main combat units of the submarine service were three Heroj class submarines armed with 533 mm torpedoes. Two smaller Sava class submarines entered service in the late 1970s. Two Sutjeska-class submarines had been relegated mainly to training missions by 1990. At that time the navy had apparently shifted to construction of versatile midget submarines. Four Una-class midgets and four Mala-class swimmer delivery vehicles were in service in the late 1980s. They were built for use by underwater demolition teams and special forces. The Una-class boats carried five crewmen, eight combat swimmers, four Mala vehicles, and limpet mines. The Mala vehicles carried two swimmers and 250 kilograms of mines. The Yugoslav navy operated ten Osa class missile boats and six Končar class missile boats. The Osa I boats were armed with four P-15 Termit surface-to-surface missile launchers. In 1990, ten domestic Kobra missile boats were scheduled to begin replacing the Osa I class. The Kobra class was to be armed with eight Swedish RBS-15 anti-ship missiles, and fifteen of them were ordered in late 1989. Armed with two P-15 Termit launchers, the Končar class boats were modeled after the Spica class torpedo boats, and there were plans to upgrade them with Swedish-built missiles. Two Kobra missile boats were built by Croatia as the Kralj-class fast attack craft and both are still in service. The navy's fifteen Topčider-class torpedo boats included four former Soviet Shershen-class and eleven Yugoslav built units. The Yugoslav navy's mine warfare and countermeasures capabilities were considered adequate in 1990. It operated four Vukov Klanac-class coastal minesweepers built on a French design, four British Ham class minesweepers, and six 117-class inshore minesweepers built in domestic shipyards. Larger numbers of older and less capable minesweepers were mainly used in riverine operations. Other older units were used as dedicated minelayers. The navy used amphibious landing craft in support of army operations in the area of the Danube, Sava, and Drava rivers. They included both tank and assault landing craft. In 1990, there were four 501-class, ten 211-class, and twenty-five 601-class landing craft in service. Most of them were also capable of laying mines in rivers and coastal areas. The Yugoslav Navy had 10,000 sailors (including 4,400 conscripts and 900 marines). This was essentially a coastal defence force with the mission of preventing enemy amphibious landings along the country's rugged 4,000-kilometer shoreline and coastal islands, and contesting an enemy blockade or control of the strategic Strait of Otranto. The entire coast of Yugoslavia was part of the naval region headquartered at Split. The naval region was divided into three smaller naval districts and a riverine flotilla with major naval bases located at Split, Šibenik, Pula, Ploče and Kotor on the Adriatic Sea, and Novi Sad on the River Danube. The strategic islands of Vis and Lastovo were heavily fortified and unauthorised entry was prohibited. The fleet was organized into missile, torpedo, and patrol boat brigades, a submarine division, and minesweeper flotillas. The naval order of battle included four frigates, three corvettes, five patrol submarines, fifty-eight missile, torpedo, and patrol boats, and twenty-eight minesweepers. One antisubmarine warfare helicopter squadron was based at Split on the Adriatic coast. It employed Soviet Ka-25, Ka-28, and Mi-14 helicopters, and domestic Partisan helicopters. Some air force fighter and reconnaissance squadrons supported naval operations. The Yugoslav People's Army (JNA) had a unique operational military doctrine for a conventional military force. Yugoslavia based its defence doctrine upon the total war concept of "Total People's Defence" (sh. Opštenarodna odbrana / Općenarodna obrana) which drew upon Yugoslavia's successful partisan history during the Yugoslav People's Liberation War during the Second World War. The "Total National Defence" concept gave the JNA the role of defending borders against aggressors with the intention of delaying an invader long enough for Territorial Defence Forces to enter the field and start wearing the invader down with partisan tactics. The entire Yugoslav population was to be engaged in armed resistance, armaments production, and civil defence under this concept. It was believed by the Yugoslav planners to be the best method by which a smaller nation could properly defend itself against a much stronger invader, specifically, NATO or the Warsaw Pact. In January 1990, the League of Communists of Yugoslavia was effectively dissolved as a national organization following its 14th Congress where the Serbian and Slovenian delegations engaged in a public confrontation. The Yugoslav army was left without an ideological support mechanism. 99% of the officers of the Yugoslav army were members of the party. The dissolution of Yugoslavia began when independent, non-communist governments were established in the Republics of Slovenia, Croatia, Bosnia-Herzegovina and Macedonia. In 1990, the Socialist republic of Slovenia changed its name to Republic of Slovenia and ceased contributing funds to the federal government for a sustained military budget. Soon afterward the Slovenian government began a re-organization of its territorial defense and the government brought the Territorial Defense Forces (Yugoslavia) under its control. In March 1991, the Yugoslav defense minister, General Veljko Kadijević organized a meeting at the military complex in Topcider. Present at this meeting were all 6 presidents of the Yugoslav republics, presidents of the autonomous republics, the Yugoslav president and all top military officers. Kadijević claimed that there were numerous paramilitary organizations in Yugoslavia sponsored by foreign and domestic enemies of the State. He also stated that YPA was dealing with Ustaše, Chetniks, and other enemies of socialism stemming from World War II conflicts. Kadijević proposed a declaration of martial law. A subsequent vote was held on Kadijević's recommendation of martial law, and the suggestion was vetoed. In April 1991, the government of Croatia formed the Croatian National Guard (ZNG), which the Yugoslav People's Army considered to be a paramilitary organization. On 25 June 1991, Slovenia and Croatia declared their independence from Yugoslavia. On the same day Slovenian territorial defense units captured Yugoslav control posts on borders with Italy, Hungary and Austria. Slovenian forces also established border control posts on their border with Croatia. As a result of these actions, the Yugoslav Army attacked; its top commanders citing the constitutional obligation to defend the sovereignty and territorial integrity of Yugoslavia. On 27 June 1991, the Yugoslav Army attacked the Slovenian TO units on borders and also in all other areas which were under Slovenian control. The Slovenian TO blockaded all the Yugoslav Army bases in Slovenia and kept them under siege for 10 days. A general state of war lasted for 10 days and ended on 6 July 1991. The Yugoslav Army suffered approximately 150 casualties. Many Yugoslav Army soldiers and officers were wounded or captured. After the Brioni Agreement was signed, the Yugoslav Army agreed to withdraw from Slovenia by 10 October 1991, leaving numerous tanks, rifles, trucks and other equipment. On 27 June 1991, war in Croatia began. The belligerents were the Yugoslav Army and Serbians on one side and Croatian military units on the other. Croatia initiated a siege of the Yugoslav Army's barracks, leaving its soldiers without food, water or electricity for weeks. Some Croatian citizens deserted from the Yugoslav Army and began joining Croatian military forces. Senior officers of the Yugoslav Army also defected to the Croatia, including Air Force Commander-in-Chief Colonel General Anton Tus. In August 1991, the battle of Vukovar began. This was the biggest battle in the War in Croatia after operations Storm and Flash. In this battle 90% of the city was destroyed. The Yugoslav Army used fighter and attack aircraft, rocket launchers, large number of tanks and other equipment. Macedonia declared independence on 8 September 1991, but the Yugoslav Army did not militarily respond. In October Vukovar was captured and 80% of Croatian forces were destroyed or captured. Many atrocities were committed by the Yugoslav Army in the city, including the Velepromet concentration camp, Vukovar massacre, etc. In mid-October 1991, Yugoslav ground forces, supported by naval and air forces, attacked the city of Dubrovnik and the Konavle area where Croats had strongholds, starting the Siege of Dubrovnik. By 6 December, the Yugoslav Army had neutralized all Croat formations in the Konavle area, but Dubrovnik had not been captured. After these two operations, the Yugoslav Army signed the Sarajevo Agreement with Croatia and began to withdraw. In January 1992 Veljko Kadijević resigned after the 1992 European Community Monitor Mission helicopter downing. The last Yugoslav Army soldier would leave Croatia in May 1992, when ships of the Yugoslav navy sailed off Vis island to Kumbor in Montenegro. The Yugoslav Army left Macedonia in March 1992. Macedonia was left without any heavy equipment, weapons or aircraft. In March 1992 Bosnia declared independence and the War in Bosnia started between Bosniaks, Croats and Serbs. The Yugoslav Army officially withdrew from Bosnia and Herzegovina in May 1992. On 20 May 1992 the Yugoslav People's Army was formally dissolved, the remnants of which reformed into the military of the newly found Federal Republic of Yugoslavia. United Nations Angola Verification Mission I (1989–1991) – military observers. ^ Forsythe, David P. 2003. Central and South-Eastern Europe 2004. London: Europa Publications, p. 180. ^ Ramet, Sabrina P., & Danica Fink Hafner (eds.). 2006. Democratic Transition in Slovenia. College Station, TX: Texas A&M University Press, p. xiii. 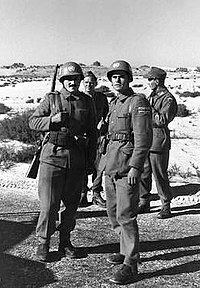 Wikimedia Commons has media related to Yugoslav People's Army.